I have a lot of other games to play so i dont mind the wait (or the cheaper price) + Base generally have great service ( Edited as sometimes, they dont as i'm finding out atm) so there's always a possibility it will turn up a little quicker. Originally released to critical and fan acclaim in 2006, Ōkami HD returns to PlayStation 4 with its renowned Sumi-e ink art style, now even more breath-taking than ever with updated visuals that take advantage of modern high resolutions. This latest release will feature stunning 4K graphics on PS4 Pro. Experience a tidal wave of colourful action when the BAFTA award-winning Ōkami HD releases on PlayStation 4! 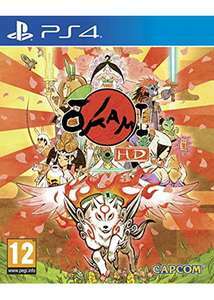 In Ōkami HD players take on the role of Amaterasu, the Japanese sun goddess who inhabits the form of a legendary white wolf Shiranui, on a quest to defeat Orochi, an eight-headed demon and tyrannical monster responsible for turning the world into a ruined wasteland. Players must use Amaterasu's magical abilities and arsenal of items, attacks and Celestial Brush techniques to restore the land of Nippon to its previous glory full of life and color. Along the way, Amaterasu will be called upon to help a cast of quirky and intriguing characters and defeat a bevy of brutal enemies to rid the land of Orochi's curse. fwiw the order i placed at 10am just got dispatched. Edit: spoke too soon, case is smashed. Base you owe me a ps4 game case.